3D printing offers exceptional possibilities for the creation of custom products. Never before have businesses in industries as diverse as medtech and fashion, had the opportunity to tailor their products so perfectly to client needs and tastes. 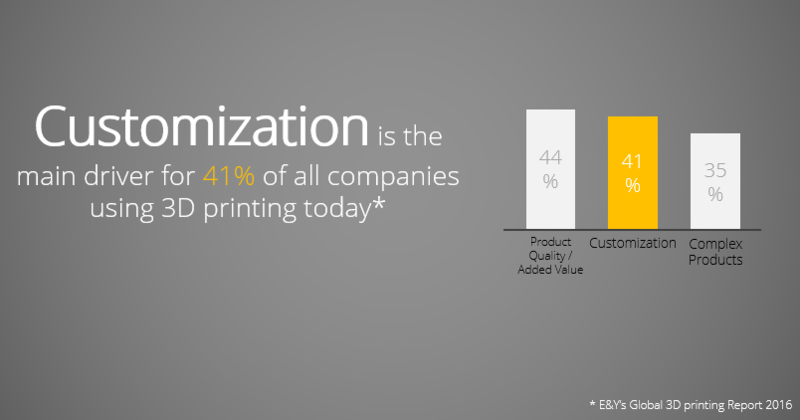 It should come as no surprise then that in a recent survey conducted by Ernst & Young, 41% of respondents stated that customization is the main driver of 3D printing (Ernst & Young, 2016). Customization is the killer application of 3D printing, and it’s not hard to see why. Additive production methods have improved drastically in recent years, as has the software that enables businesses to fully leverage the potential of 3D printing. All this means that businesses and consumers alike can profit from the benefits of ‘going’ custom. One such benefit is the attainment of unparalleled custom fit. Whether ergonomic or mechanical, custom fitting improves performance and comfort. Take for example the case of a robotic gripper. When these components are tailored to their workload, manufacturers can achieve better results. The same is true for a pair of glasses. If they are individually fitted to the wearer, there is a massive improvement in comfort. Once products are customizable, there exist new opportunities to interact with customers. With the help of user-friendly applications, consumers can take part in product design. Not only does this allow them to express their style and tastes, but also exercise an unprecedented degree of control over what they are buying. So, why custom? Because custom products better fulfill customer needs, and thanks to 3D printing businesses can now create these products time and cost-efficiently. Of course, the benefits don’t end with customization. 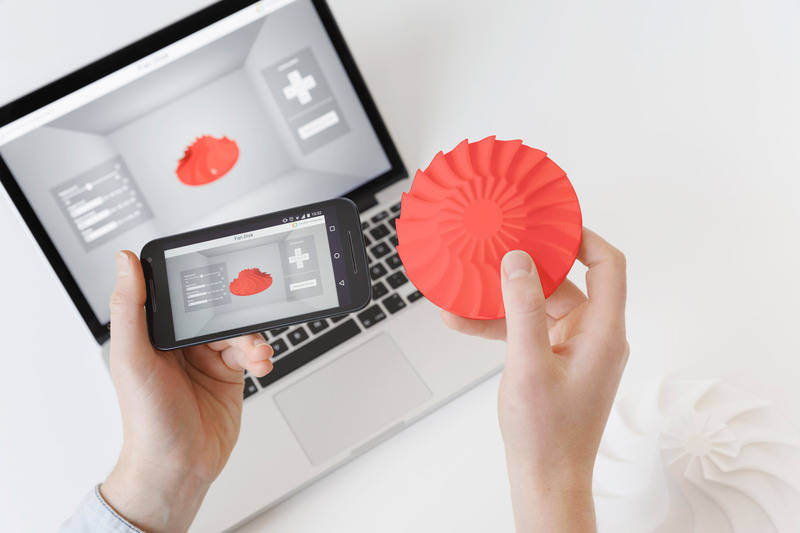 The combination of 3D printing technology and software to create custom products means businesses can avoid mass producing products, eliminating expensive product stockpiling. Businesses can also serve any niche group. Dynamic, customizable products mean that endless product variations can be added at any time, so there is always something for everyone. By now you are convinced that custom products offer you and your clients serious benefits. The question is what steps do you need to take in order to make your product portfolio custom friendly? A crucial first step is developing a ‘custom concept’. This custom product concept will guide your development, and help guarantee that you are creating products with added value for your business and clients. We have supported countless businesses throughout this process, so we consider ourselves veritable custom concept experts. Here are 4 tips you need to keep in mind when you want to start creating custom products. Not every product is custom-friendly: Custom is everywhere. Products and business models with customization at their core are very much in vogue, and that can put pressure on businesses to introduce customization. But, in truth some products are just not custom-friendly. For example, a component for a car engine will be standardized and subject to often rigorous performance and safety standards. In this case, there isn’t a need or the wiggle room to offer customization. The key to getting the most out of 3D printing is identifying products or product groups that will maximize your added value, as well as your customer’s. At the end of the day customizing for the sake of it will just cost you more. Not only that, but an ill-conceived custom product could end up not being scalable and cost your business more than it generates. Not sure how to identify if a product is suitable for customization? Here are some things to keep in mind. Do your clients often request alterations to base products? If a product often requires an application-specific adaptation, you could look at customization. Does your product need to be adapted to the physiology of the user? Products like glasses or prosthetics have to be personalized to the wearer and are perfect candidates for customization. Be prepared to leave existing products behind: We certainly don’t mean that you should abandon the core of your business, or that the exact products you have now aren’t able to be manufactured with additive technologies. Very likely they are. But, 3D printing, and customizable products in specific, require a different approach. The question is not ‘how much will this widget that we always make, cost us if we 3D print it?’, but rather ‘how will making this widget customizable improve its functionality, or allow us to serve a broader customer base? Let’s return to the example of prosthetics. In this case truly customized devices improve the comfort and mobility of users. Moreover, by offering the opportunity to customize the style, overall patient acceptance is improved, as patients identify more readily with their prosthetic. But, to offer this kind of customization the prosthetics have to be seen as dynamic products, rather than static. Customizable products represent a shift in the prevailing design paradigm, one that businesses need to be open to. Design is not dead. It’s more important than ever: Creating a basic design, or several, and offering customization may have you thinking ‘well, that’s great. We can spend less time stuck in the design and product development phase.’ Tempting as that thought may be, you need to ignore it, because it turns out that the opposite is actually true. The conceptual phase is critically important and will determine the success of any customizable product. Design and product testing are going to change, and you cannot afford to neglect them either. You will want to spend time on conceptualization so you understand these new products you are creating, can test different variations, and at the beginning of the process to determine if this custom product makes sense for you and your customers. Consider offering a line of customizable jewelry as an example. Before customers start customizing, it is good to know what they could create and what challenges may arise as a result. For example, a certain design could have a weak point, or be especially challenging to finish. If you test in advance, you can identify these issues and tackle them early on. Know your reasons for customizing and don’t tackle more than you can handle: Customization represents a new part of many businesses, and for that reason it is best to start small and then scale up. In theory, you could make your entire product catalogue customizable, but what do you and your clients stand to gain from this? Really ask yourself: why are we customizing? What value does it add? Are we creating products with better fit, more efficient mechanical functions, or allowing our customers to express their personal style. Know your reasons and challenge them before you start looking to branch out. There are a lot of factors to consider when you want to introduce custom products or innovate a previously ‘static’ product with customization. Improvements in additive manufacturing technology have brought serial production within reach, and in combination with the right software innovative ideas and business models are realizable.